Candy Cane Crush is fantastic. That's it. It's great. With it's multiple sizes of red and white glitter, this polish could be worn year round without raising any eyebrows. It's very very dense and is scented like vanilla peppermint. I'm not normally one for scented polish but this one is divine. I kind of wish every polish smelled like it. The peppermint cuts the vanilla's sweetness without being too minty. 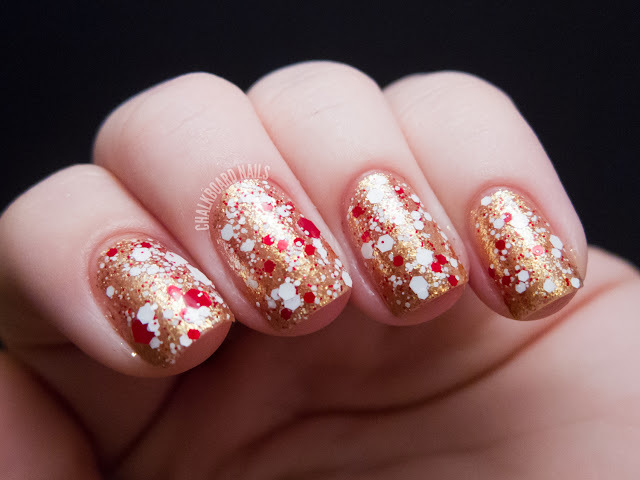 I've shown it here over OPI Goldeneye for a majorly blingy holiday look. Next up is Cocoa Nut! 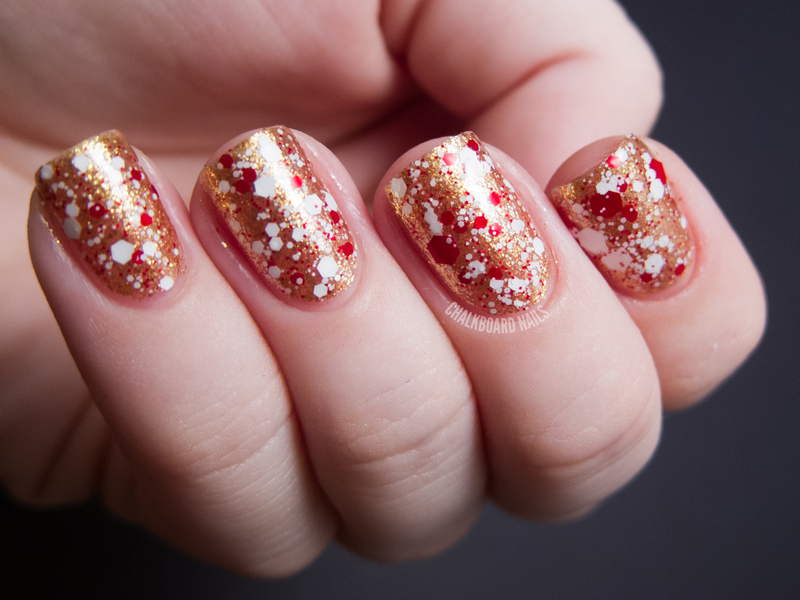 A delightful brown polish with reddish pink glitters, Cocoa Nut will make you hungry for cherry cordials. There's also a lovely gold microglitter for a bit of extra oomph. This polish has great coverage, too, needing only two coats for the photos below. Something else worth noting is that Christy has recently started using a new brush style in KBShimmer polishes. The brush is a bit wider, but not too wide! It made it easier to grab good amounts of polish and made the whole painting experience go more smoothly. So there you have it! Which ones are calling your name? KBShimmer is sold on the KBShimmer website and on Etsy. International polish lovers can check Harlow & Co and follow KBS on Facebook for restock news. Products in this post were sent for review. I'm loving all the glitter polishes this season! Candy Cane Crush is AMAZING. Love your candy cane pairing! these are gorgeous, I love the first one! I like the brown one :p sooooo pretty! Snow Way is sooooo awesome! Snow Way is so pretty! I love the light blue mixed with the white. My favourite is cocoa nut, the combination of colours is so unexpected, and it works! I love Cocoa Nut and Snow Way! Snow Way! is my favorite by far, but they're all lovely! Snow Way is really pretty! If you want to twirl in the snow, I'd love to switch places with you. The snow melted here all ready, but I have a visceral reaction to snow! I HATE (and multiply that word by one million) snow. I wouldn't live where I live if my dad hadn't plunked us down here (his excuse is he wanted to be near family; I don't buy it. I think he did it so we didn't have to move for the 12th time!) I'd much rather be in Arizona where it's hot! I love heat! Ooo I like Cocoa Nut, it is gorge! I love Candy Cane crush and Snow Way. Just looking at them makes me feel all Christmasy!